Improve your health by standing at work! It's no secret: a sedentary lifestyle can negatively affect your health. And spending several hours a day glued to a chair is the reality in most jobs. According to the World Health Organization, a sedentary lifestyle doubles the risk of heart disease, diabetes and obesity, and increases the risk of depression and anxiety. In fact, being inactive is almost as bad as smoking. Not a pretty picture... To stay healthy, it is important to spend less time sitting and more time moving. And given how much of the day is spent at work, the changes start at the office! Changing positions while you work is an easy solution with a positive long-term effect. Alternating from sitting to standing helps limit strains and musculo-skeletal problems. Working in a standing position increases blood flow and, in turn, productivity. 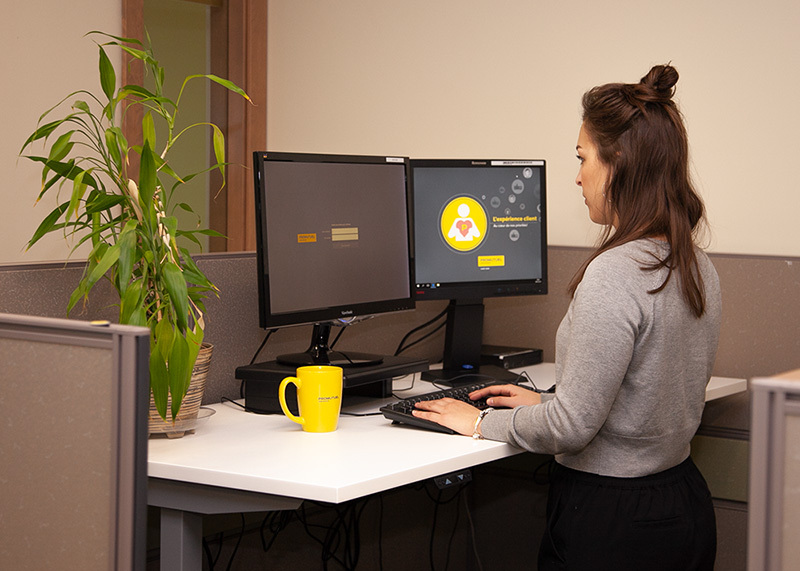 Employees' health and wellbeing are part of Promutuel Insurance's company culture, and this is apparent in the offices' ergonomics. That is why standing workstations have been set up at our Québec City office. Employees therefore have access to workstations that allow them to spend a few hours a day in a standing position, if they so desire. Some tasks can be performed in a standing position without problem with a standard desk, whereas others need an adapted workstation to work on their feet. Developing this type of work space can be expensive, often requiring more complex logistics. Taking a few minutes out of your day to get up and move has lots of benefits. So go ahead and do it! It will make you more productive. It is time well invested. Now get up... and get to work!